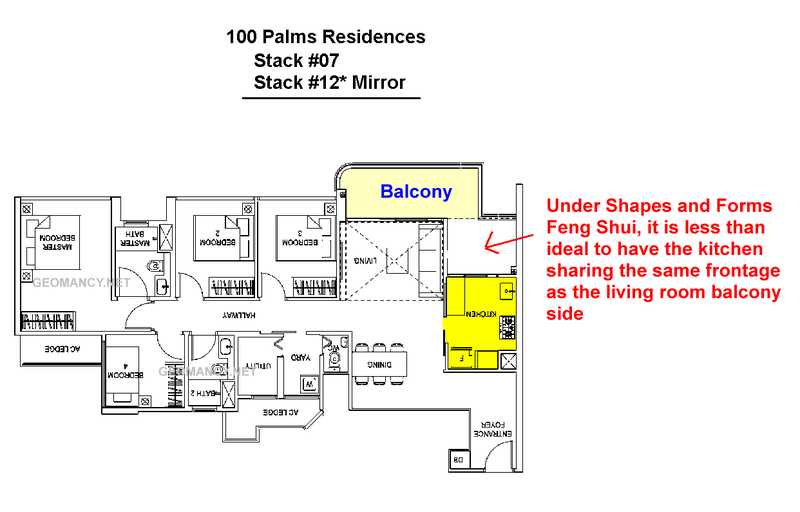 Based on the site-plan, under Flying Star Feng Shui, majority of the stacks/units either face N3 or S3. However, based on the Sales Brochure, see below; the North compass marking is instead 15 degrees or 5 degrees more than the above. The good thing is that even if the North stacks are facing 10degrees or 15 degrees, it is still within the tolerance of N3. Thus well within the tolerance of a Period 8: N3 or S3 facing stacks/units. When TOP, best to take a proper reading(s), still. One of the major considerations when it comes to resale value is the location and opening of the common rubbish chute. Although the common rubbish chute is shown in the attachment. 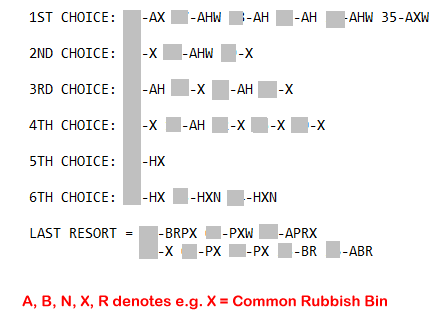 I have marked it as "X". But, not that clearly shown, though. Please note that these Teo photos, shown below are samples from recently T.O.P. developments. Where some owners found too late that the common bind are right at their door step.. 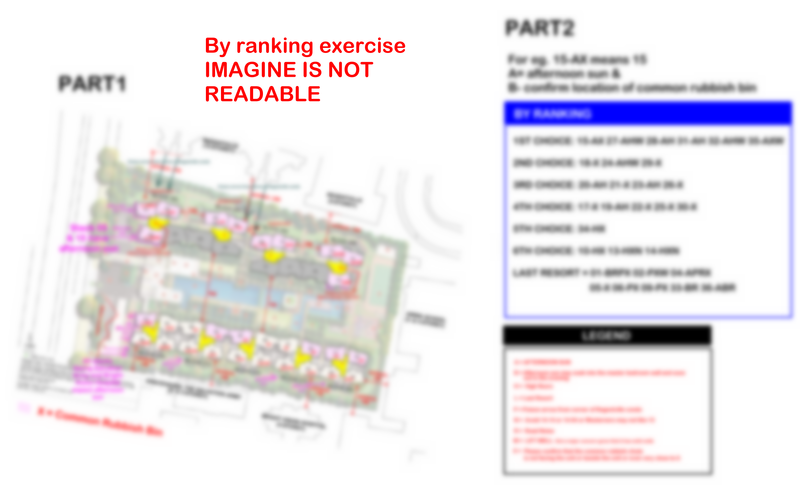 Even with a door.. it may hurt re-sale values..
Can or cannot buy By Ranking Exercise. The image is purposely "blur-out". Will only be released after at least more than 90 percent fully sold. "Question: 1. You have seen so many developments. 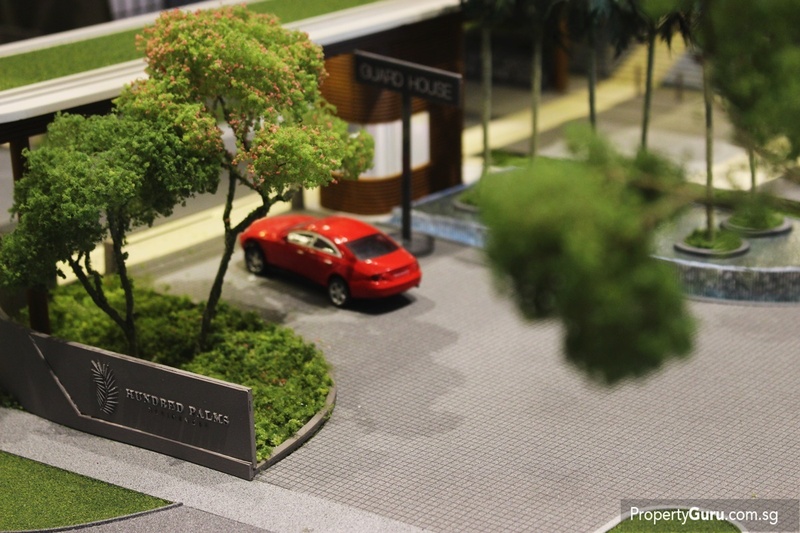 Should we give this development a miss?" For units facing "easterly" with a commanding view of the sea and no afternoon sun. 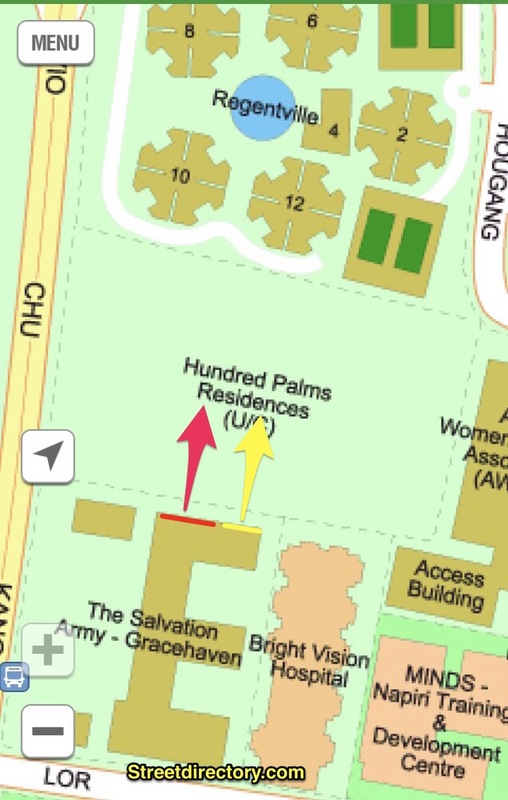 Many of my clients both in Regentville or at this 100 palms HAVE a primary motive of a school with the motto "Ready to serve" aka Royth School. This site is not fantastic. 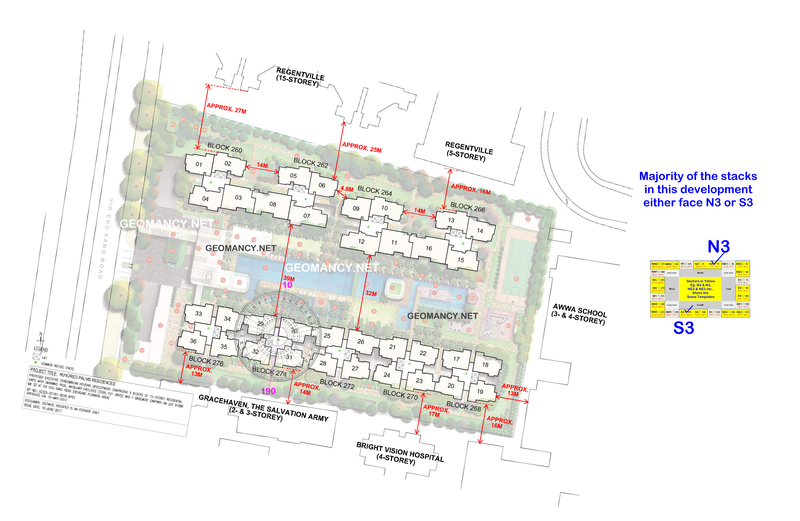 Overall an average site: where there is a busy Yio Chu Kang Road; and North facing stacks face into Regentville. And there are some poison arrows from Regent ville towards several North facing stacks/units + some lower units face the MSCP or Regent ville. From a Feng Shui perspective, the 3 bedders facing Salvation Army are acceptable so long as high floors are purchased. As there are roof-lines that can cut into several units, here. Pool view facing units are acceptable. I know of several clients who had previously explored purchase of Regentville for an ulteriol motive: a popular school with the moto "Ready to serve!" Let's hope that school Roysth does not move into another premises.... then Oops! 1. Under Shapes and Forms Feng Shui, it is less than ideal to have the kitchen sharing the same frontage as the living room balcony side. 2. Usually, the kitchen and service yard is on the opposite side of the living room balcony. 3.1 What I feel is that it also depends on how one maintains the service yard. 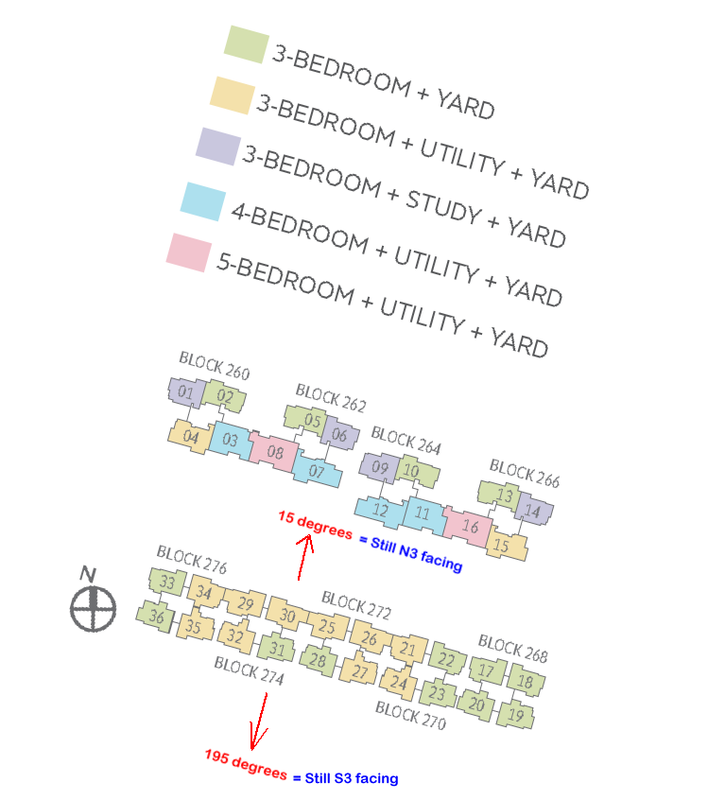 I did an analysis of two units in this development. 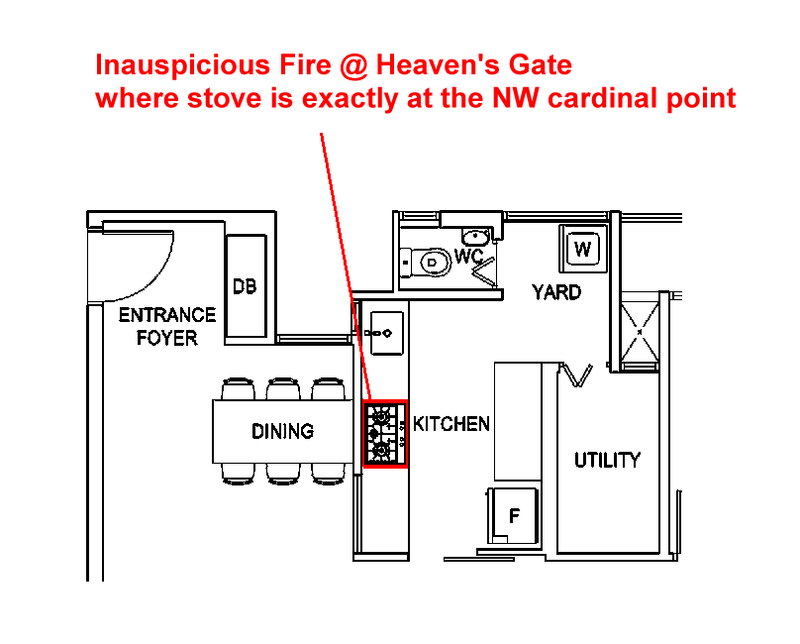 And so happens that the stove falls directly at the NW cardinal point. This is considered inauspicious and come under the term Fire @ Heaven's gate. Here, whenever one uses a flame stove; it is considered as burning luck from heaven. As well as affect the male's career. 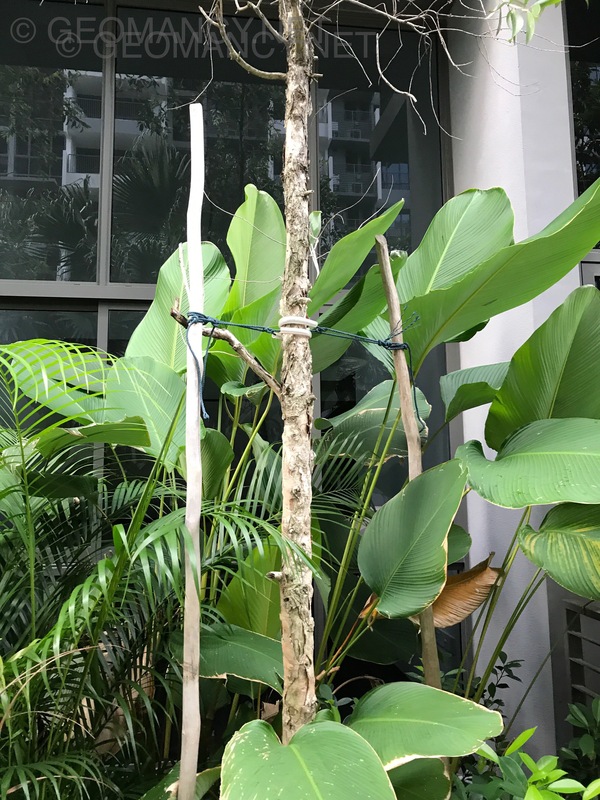 Palm Tree trunks may become a poison arrow if it is aimed towards a unit's opening such as the balcony sliding door glass area or windows. Which units may be affected? Please see the artists illustration. Units closest to these tree trunks are subject to potential threats if there is a clear line of sight between the tree TRUNKs and the unit's openings e.g. the balcony or windows. Firstly, if the tree disappears.. then problem solved. If it is facing a window opening... installing a day curtain and drawing it permanently closed is a good idea. What happens if the tree trunk seems to slice towards a balcony sliding panel opening? This is harder to cure: as it is not possible not to open the balcony panels 24/7. Perhaps installing a zip-track or external blinds and lowering it down fully...may not be a good idea as it may mean making the balcony area dim/dark. 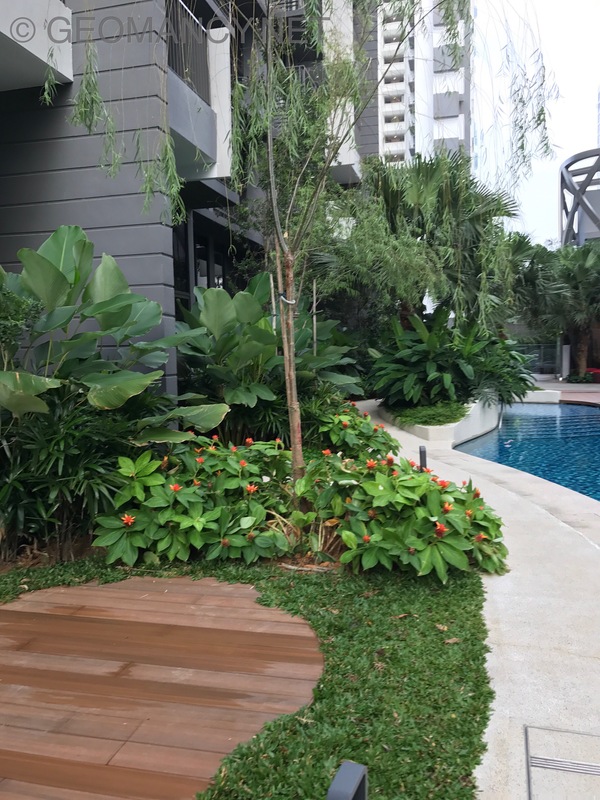 However, if between the tree trunk and the unit are bushes, then it is okay especially for the ground floor unit. 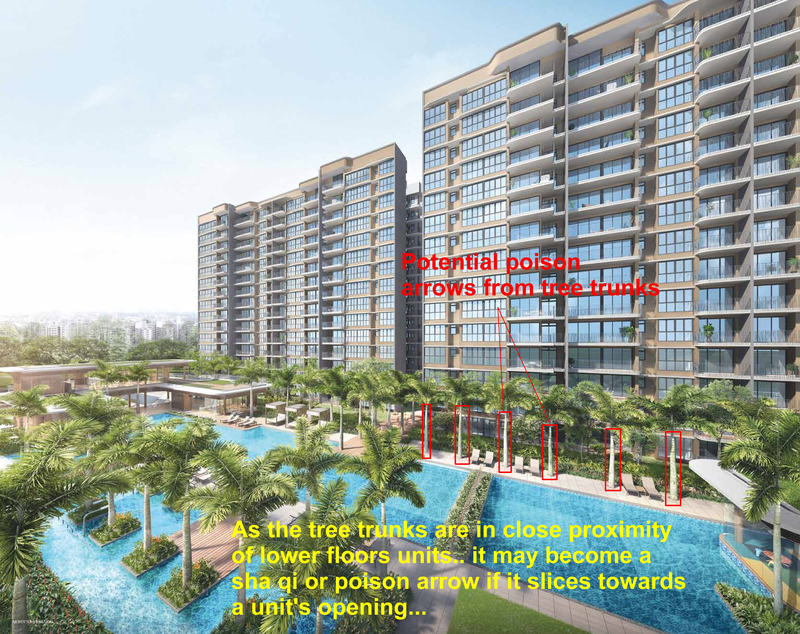 But if the tree matures and the tree (with its trunk) can be seen at 2nd or 3rd storey.. then these units better watch out! 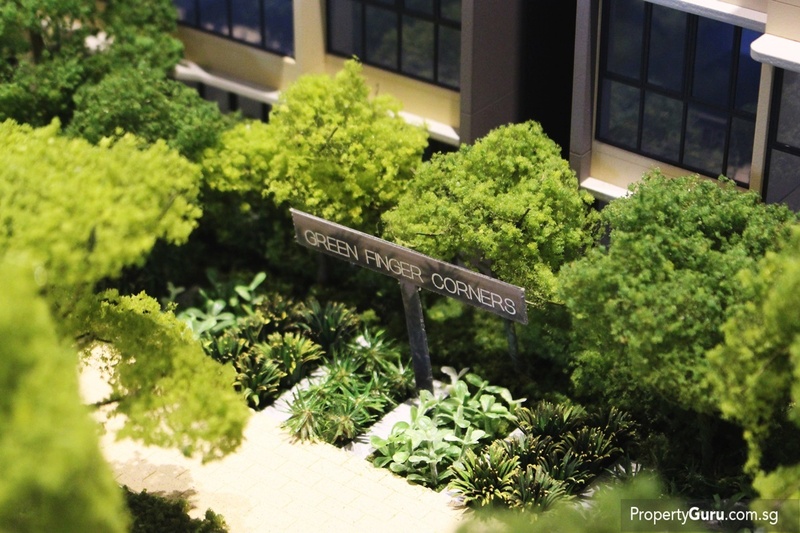 These trees are from various other developments. 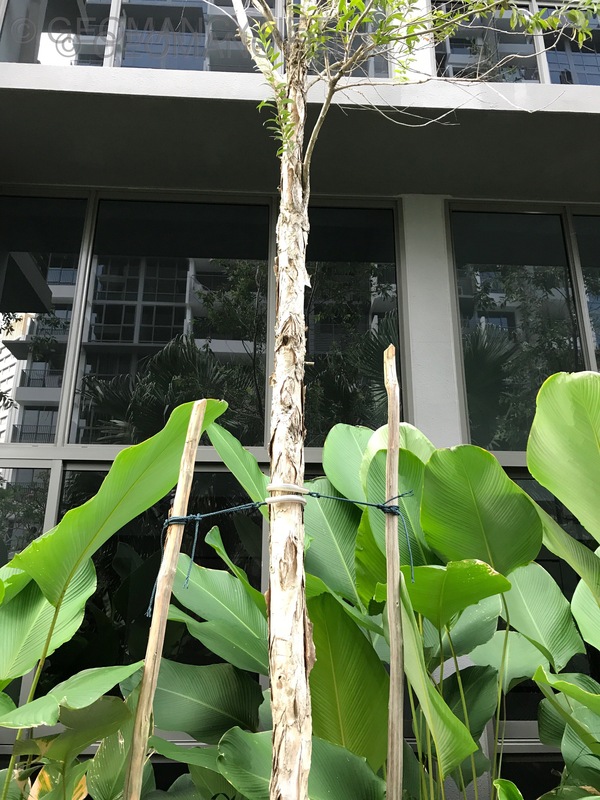 when these tree matures, may be a potential poison arrows to either ground floor units or 2nd or even 3rd storey high or higher.. depending on whether the tree trunks rise to that level. Q1. 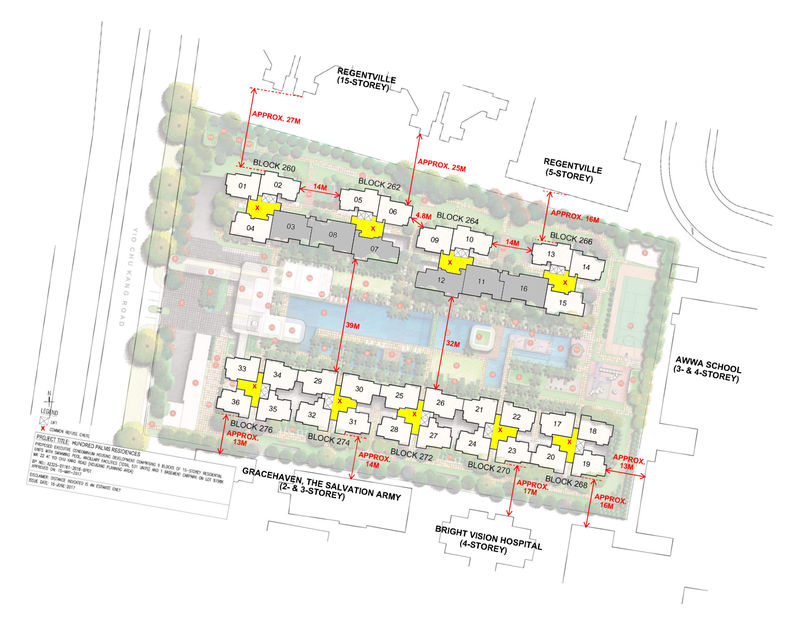 Question: Can I place an Option to purchase for unit not just in this development but also in other developments during the Chinese 7th month? 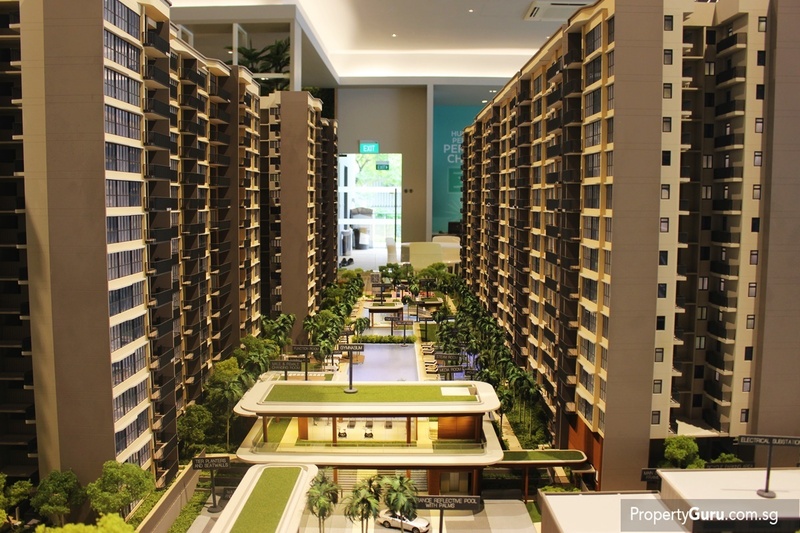 1.1 The sale or rather the balloting for this development starts exactly a month prior to the Chinese Hungry Ghost festival or 7th month. 1.2 Given that no major infrastructure is up; and for those who do belief in (or concern) of the Chinese 7th month; really have nothing to fear if one wants to book a unit in an uncompleted development. "Since there is no physical place for these hungry ghosts to get shelter, why worry about it." Q2. Question: Can I start renovations during the Chinese 7th month for a home that has T.O.P. or had been so for quite some time? 2.1 Again, this is based on logic of deduction. 2.2 The senario is that one can start renovations before the 7th month. And continue with it during the Chinese 7th month. Here, the belief is that "they" are like us. 2.3 These hungry ghosts have not "taken possession" of a home/apartment yet. 2.4 And if a place is messy, dusty and noisy.. if it the house is not fit for human consumption; how is it going to be fit for ghostly consumption also? 2.5 Assuming that these hungry ghosts had found a vacant home during 7th month. And if one were to start renovations.. when they are there.. For this reason, often, many don't want to take a chance of "angering" these ghosts. Hougang 1 (formerly Hougang Point) besides Hougang Mall prior to the development was the two nearest shopping centres. 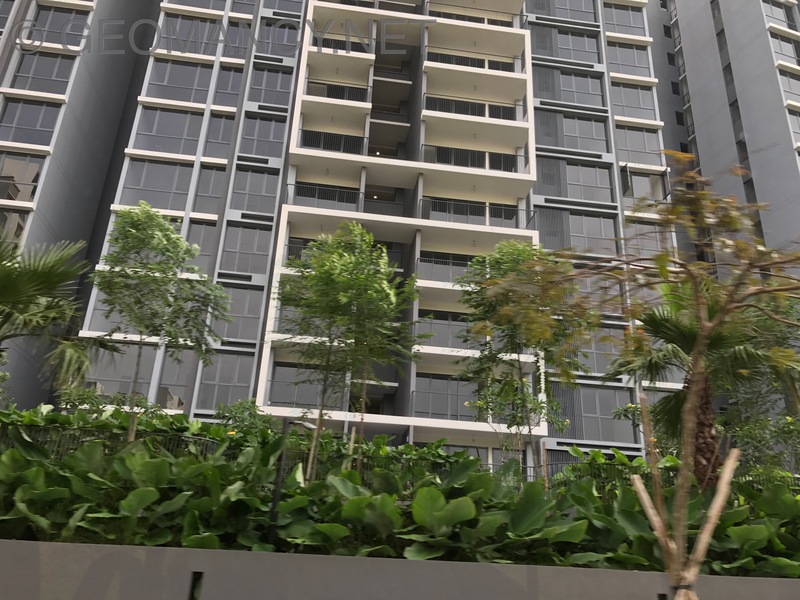 They together with Seletar market (off Yio Chu Kang Road - currently Greenwich..) served residents of Hougang and the near-by Seletar (and Seletar Hills) estate. 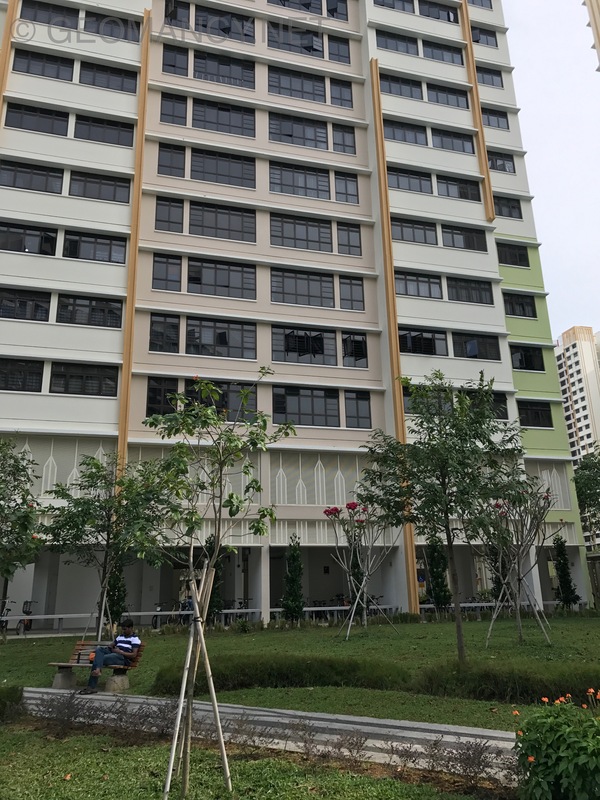 When HDB Hougang Crimson T.O.P. two years ago.. I was expecting to go for a quick lunch at Hougang 1. But was surprised to find the entire ground level of Ci Yuan Community Club (CC) converted into a Hawker centre. With the front retaining the Peoples Association office. There is one avenue for those who do not cook to take a leisurely walk towards this hawker centre as an alternative instead of dining at Hougang 1. Thanks for starting this thread on 100 Palms. We are looking at this project, but heard many feedback about being near to hospital the negative energy is not good. Will it help if we choose pool facing units instead? 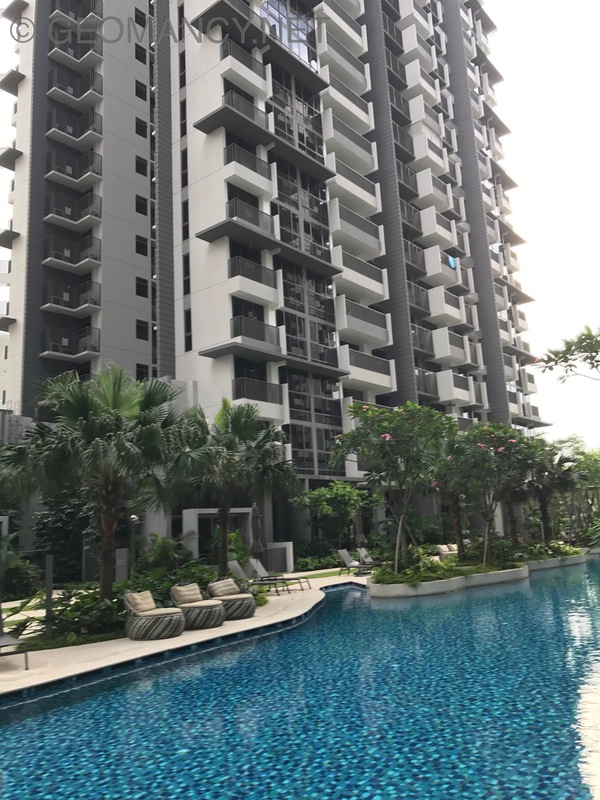 We are keen in mid level and above for the 4br stack and are initially keen in the 7 & 12 but after reading your comment above seems like its better to swop 03 &11 as priority choice unit instead. 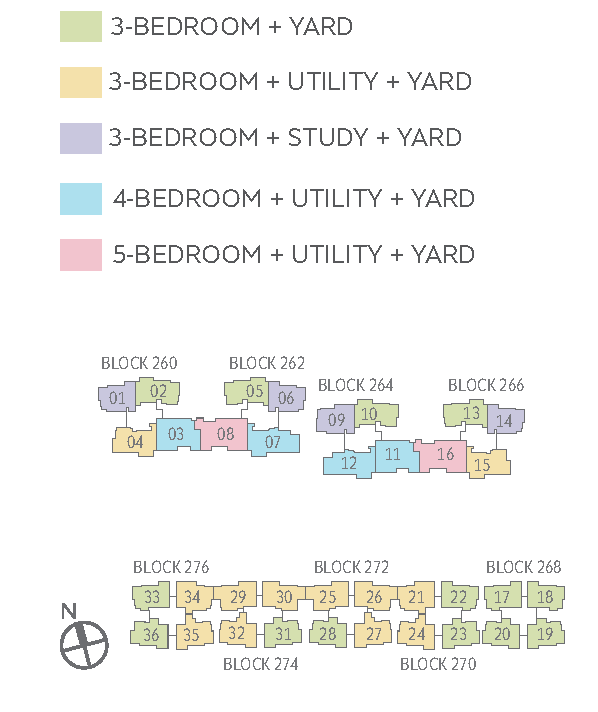 Are the 4 bdrm ok to choose in general? Heard this EC sold out within a day. Lucky you... Got agent friend worked on it for months but end up the clients all didn't get. My agent friend 5 units ended up nothing. Want to cry also no tears. Not me Lee Hai.. lah..
Found some pics of show model online, anyone has more from different angles?